– 3 to 8 weeks old in puppy. A Puppy has 28 Milk (Temporary) Teeth. – 2 to 4 weeks old in kitten. A Kitten has 26 Milk (Temporary) Teeth. • They are large in size. • They last for the whole adult life. • They may show signs of wear as the dog or cat age. • A Dog has 42 adult (permanent) teeth. • A Cat has 30 adult (permanent) teeth. – Disease of structure surrounding teeth. – Due to building up of dental plaque and calculus. • Calculus is mineralized, stone-like concretion of accumulated dental plaque. – Milk (temporary) teeth are seen together with adult (permanent) teeth. – Food materials and debris can be trapped between teeth. – Very soon leads to periodontal disease. • Bad smell from mouth. • Bleeding and/or ulceration of gum. • Teeth of dog and cat must be cleaned daily to prevent the building up of dental plaque. • Use especially designed tooth brush and tooth paste for dog and cat. • Tooth paste for dog and cat is less foaming and it does not contain too much fluoride and sodium. 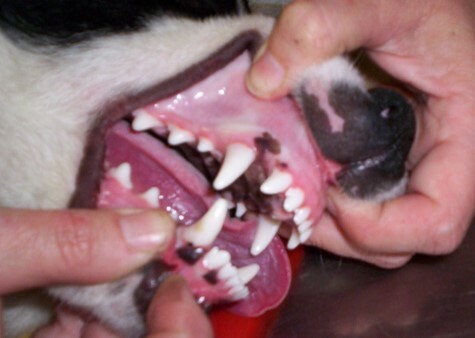 –Teeth of dog and cat must be checked by veterinarian once every 6 months. –Scaling to remove dental plaque and polishing to prevent building up of dental plaque are required to be conducted by veterinarian once every 6 months. – Dog and cat must be fed with suitable complete and balanced foods to keep their teeth in excellent condition. – Ask the veterinarian in Craigieburn Animal Hospital for the foods that best suit your dog and cat.